My second day at conference was relaxing after the uncertainty about my session. I kicked off the morning with a plenary panel on Engineering in the year 20/20. It ended up being a bit different than I expected, but I still gleaned some useful information. From the panel it was off to another session--this one about raising daughters to succeed in the workforce. I thought it would be interesting from an outreach standpoint, and it was. Plus the moderator was the professor of Product Development I had met the day before, so it was a good chance to say hi again. 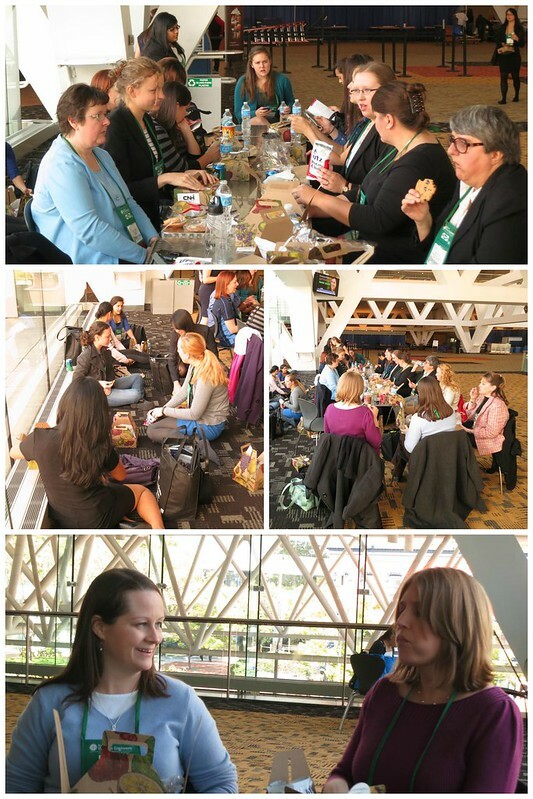 After the panel, I grabbed my boxed lunch and joined the other women from my region who were at conference. We were a good sized mob and the meal was full of boisterous conversation, laughter, and catching up with old friends. 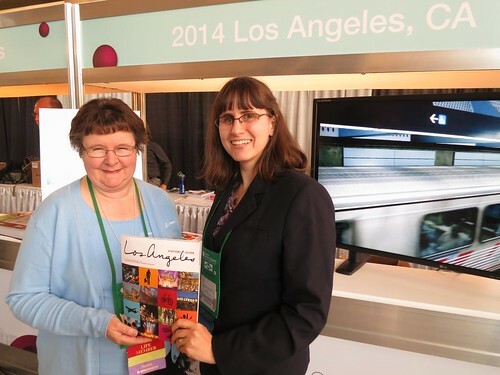 Only one other woman from my section was able to attend conference so she and I took this picture to remind our other members that next year's conference would be in LA. The woman who took this picture for us was someone working the registration booth, she did a fabulous job! After lunch, it was onto more sessions! I went to one on expanding your strategic network and one on when to stop innovating. The networking session was interesting, they took a more tactical approach (mapping your network, identifying actionable items), which set it apart from more general "networking is good" sessions. The Innovation session had a last minute speaker switch so the original topic was a little lost. Still, it was neat to hear experiences of someone else who does a lot of work with prototypes and I picked up several interesting facts. By the time the sessions wound down, I was beat. I headed back to the hotel to prepare for my flight out the next morning.